1. Thoroughly clean the basin, shells, and vase. 2. Paint any chipped enamel with matching nail polish and allow polish to dry. 3. 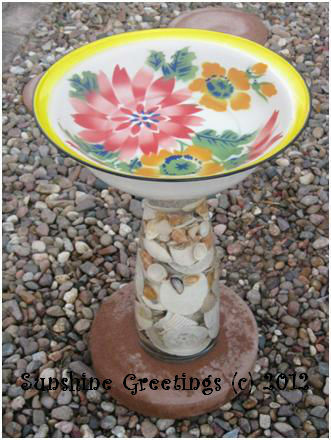 Arrange seashells in vase that will become the neck of the birdbath. 4. Fill vase with water and add a ¼ cup bleach to prevent algae. 5. Place a stepping stone in a flat area of your garden. 6. Set the vase filled with bleach water and shells onto center of stepping stone. 7. Place center of basin over the top of the vase. 8. Fill basin with water. 9. Wait for the birds to come for a refreshing drink or to take a bath. What a wonderfully creative friend I have!! Nice complimentary blog but you forgot to say that the seashells were yours and you're the sounding board for my unusual ideas - LOL. Glad to be show cased, though instructions were just my way of saying thanks for helping me with the finds and to share the success of a good day of "finding". Oh wow...that is so cool! Ok...now I think I may just hit the thrift stores tomorrow! Thinking of looking for things to repurpose for our Ladies Spring Tea! Thanks for all of the inspiration! 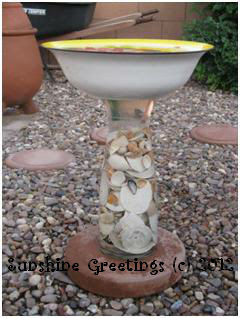 how fun!you know I love a great repurpose, and I love helping out the birds! This is really fun! So unique and the finished product is really cute.